We had plans for the Bank Holiday weekend. The first thing on the agenda was finishing the mini polytunnel. That went out the window when we realised we didn’t have enough netting, and we would have to order some. It’s on its way, together with some ironmongery to make a door. So with that off the table, we thought we’d make some progress in the extra strip of garden. It’s behind the back garden (which is technically to the side of the house), fenced off and accessible only from the road. The first year we got here, we left it to its own devices. It had been planted with low-maintenance shrubs, which we removed at the beginning of 2016. 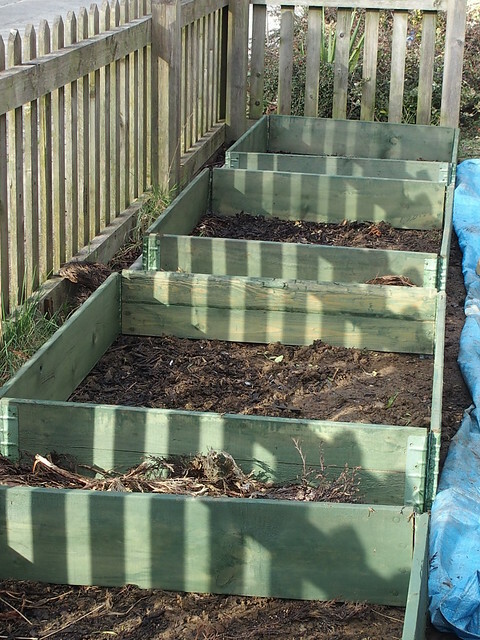 We installed 4 cheap, recycled raised beds, and planted potatoes and oca. 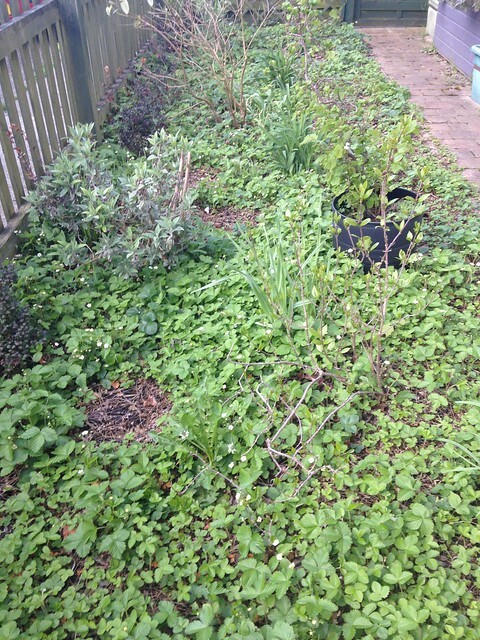 Last year I did the same, but by then I had a new plan – I was going to use the strip to grow some of the shrubby perennials I have been keeping in pots. They needed a permanent home, and that was where it was going to be. We had some timber left over from making the raised beds in the back garden, and were going to use it to make a raised bed for the rhubarb. A few months ago we also bought a cheap trellis, to fasten onto the fence so I could grow hops (which I grew from seed) for hop shoots. We’ve never got on top of the weeds in the strip, so we worked to clear a section next to the fence, and then Ryan installed the trellis and I planted out the hops. 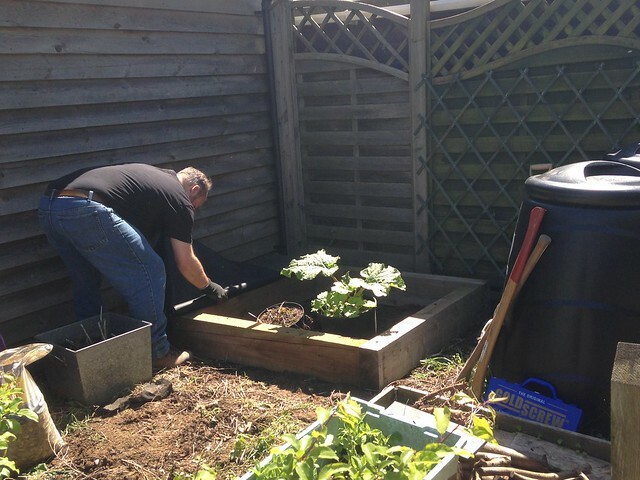 Ryan put together the raised bed, and we started to dig out one of the compost heaps to fill it. And uncovered two quite agitated bumble bees, which (I assume) were trying to nest in the compost. In the end, hot and cranky and chased by bees we retreated to the house. We went out later to plant the rhubarb, and as soon as we started shovelling compost again, the bees returned. Still angry. We gave up. At this point I lost my temper a little bit and had a rant about how much I hate the Strip garden. It has a little picket fence (like the front garden), which means when I garden out there I’m in full view of passersby, which I don’t like. It’s one reason I was never very good at keeping an allotment; I prefer to garden in private. And the fact that you have to leave the house and walk down the road to get to it is a bit of a pain, as you have to keep walking back to the main garden for tools/water/plants etc. It’s just not conducive to nipping out there for a few minutes. 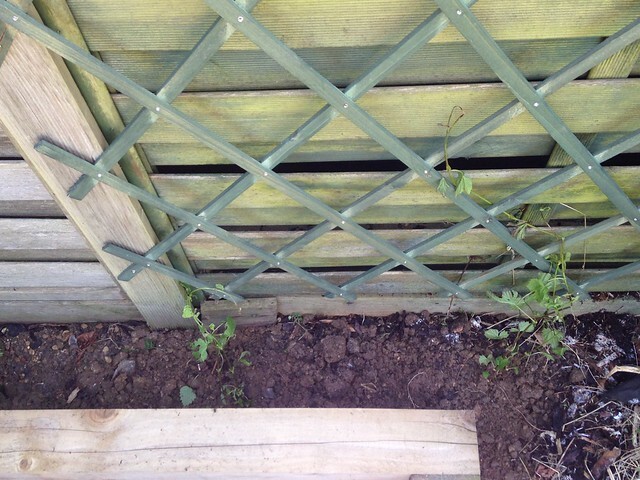 The soil there is pretty rubbish, the garage block creates a rain shadow, and the main garden fence creates some serious shade issues (although, whenever I’m gardening out there, the sun seems to shine right in my face!). Having listened to me say all this, Ryan came up with a new plan. The idea is to replace the fence at the front of the main garden (which is ageing), and to extend it around the Strip, so that we end up with a larger back garden. Rather than attempt to use it for gardening, Ryan wants to put a large shed/workshop there, to give us more storage space and him more working space. This would involve getting rid of my lovely lavender shed (boo hoo! ), so that we could access the new shed. 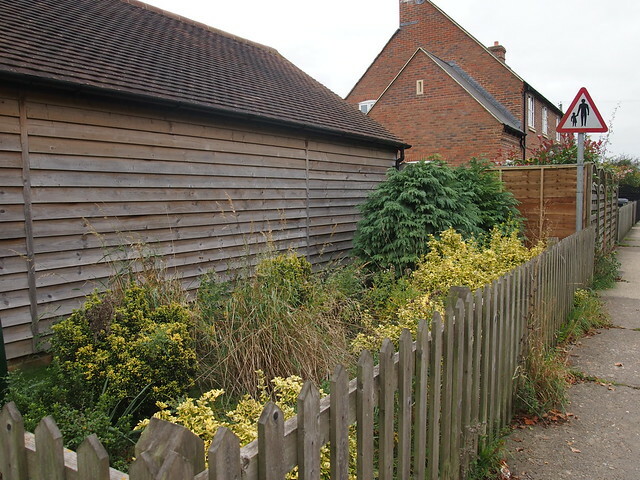 Ryan would then vacate his original shed (and repaint it lavender!) for me to move in to the other side of the garden. Although I will lose some gardening space, we would be able to turn the paving my shed currently sits on into a nice seating/dining area, with a shade, which is something we currently lack. There are one or two hurdles to overcome (not least of which is the street sign currently in the way of the new fence), so we’re not sure of the timeline. In the meantime, I’m thinking of upgrading the front garden with some low-level raised beds (the soil there is not much better) and turning it into a fruit garden. At the very least, it would give me somewhere to plant the rhubarb. And there’s another bank holiday weekend later this month…. There’s a bee hotel elsewhere in the garden, and they’re the wrong sort of bees to interest a bee keeper. They’ll be fine – they’ll just have to find somewhere else to nest!